What better way to spend Father’s Day than in the company of a bunch of orphans! That’s right, it’s an All Just Enough To Bluff episode of DITB focussing on World Masterpiece Theater. Niall Flanagan joins us as we check out the first episodes of Rocky Chuck, Heidi, A Dog of Flanders, Marco: 3000 Leagues in Search of Mother, The Story of Perrine, Anne of Green Gables and The Adventures of Tom Sawyer. Good episode. Out of the collection I’ve completed Anne of Green Gables, along with Marco and I’m working my way through Heidi. – Yes, all of these shows are fairly ‘slow’ going, especially compared to modern productions with fit far more ‘plot’ into 12 episodes shows. However, at least for the Takahata productions, the investment is worth the effort. – Anne of Green Gables is easily the strongest of the three in part because the source material feels far less ‘stretched’. – The monkey in Marco certainly plays a very prominent role and the animators clearly enjoy getting him involved in all kinds of wacky situations. He certainly feels like the inspiration for many other monkeys in anime such as the ones in Kemonozume and Blood Blockade Battlefront. – I’ll agree with Brian that the start of Anne of Green Gables is extremely impressive in terms of its animation but the show is somewhat uneven. It’s highs are extremely high and it looks good throughout but there are noticeable dips in quality. “Zuiyo’s triumph also contained the seeds of its own destruction, with animators on Heidi investing substantially more effort than was commonly expected in TV animation. Kotabe Yoichi, one of several Toei employees working on the project, reported that despite directives to shoot ‘on threes’ in the Mushi Pro mode, certain animators on Heidi racked up cel counts of 8,000 per episode. Heidi’s animators went on a location-scouting trip to the Swiss Alps, to help them replicate real-world environments. They also conducted painstaking research in order to achieve lasting images. 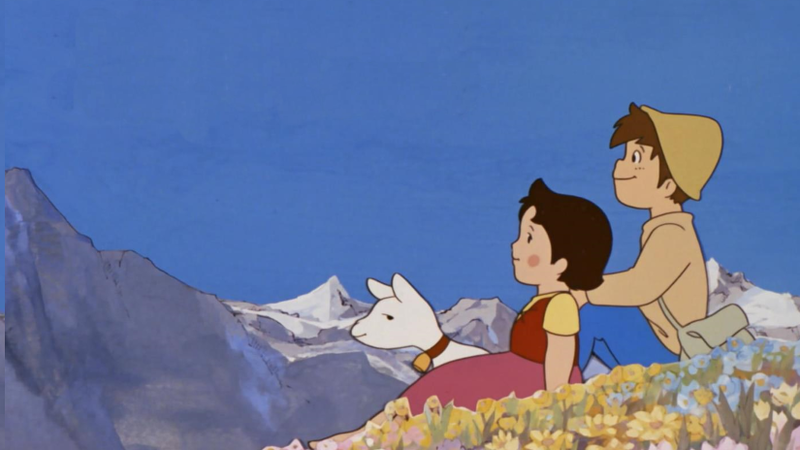 Heidi’s opening credits including a sequence in which Heidi and her shepherd boy Peter clasp hands and skip around in a circle. Mori Yasuji ordered his colleagues Kotabe Yoichi and Miyazaki Hayo to shoot reference footage to aid in the placement of arms and bodies, leading the two animators to re-enact the scene in the studio car park. ‘two animators to re-enact the scene in the studio car park.’ Now that would have been an interesting segment to include in the closing credits of the episode.